Today I got my fast ADSL2+ Internet installed, so Malty no pigeon can beat my Internet. But a pigeon can still beat the majority of aussie's internet connection. Correct me if I'm wrong, but it could beat your previous one? 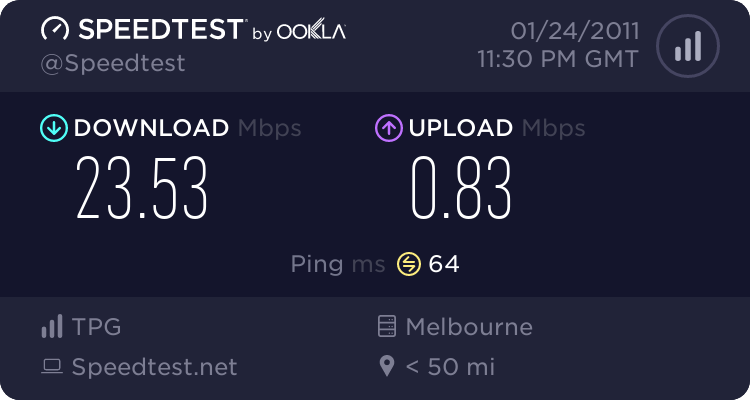 yeah your right malty the pigeon would have been able to get to Melbourne and back before i was able to download anything on my previous connection. BTW youtube link is dead so try this instead. Im running 2+ now aswell, however in the UK most comms lines are 3rd world. I can see the exchange from my house, yet im losing 17mb of my connection over that distance.